We present the organosilicon-sensing riboswitch that was designed in silico using the Making Aptamers Without SELEX (MAWS) 2.0 software provided by the iGEM Team Heidelberg 2015. Upon the binding of its specific substrate, the expression of the downstream gene of interest can be enhanced 1.5-fold compared to the unspecific binding of other organosilicon compounds. Thereby, proving to be selective and efficient. Riboswitches, in general, are regulatory elements that are used for the binding of specific molecules to release an intrinsic RBS which subsequently facilitates the translation of the downstream gene of interest [Henkin et. al., 2008]. This riboswitch, in particular, was designed in silico for the specific binding of one organosilicon. It binds the product (5) that is depicted in Fig. 1 and makes the transcript of the reporter accessible for ribosome binding. The proof-of-concept for this riboswitch has been successfully demonstrated in a riboswitch binding assay. As a next step, this part can be implemented in the directed evolution approach of phage-assisted continuous evolution (PACE) or in the phage-related discontinuous evolution (PREDCEL) approach. Therein, it aims to improve the organosilicon synthesis by regulating the evolutionary selection pressure via gene III expression. To prove that our riboswitch can activate a downstream localized gene of interest we designed a reporter system in which we cloned the riboswitch between a promoter region (downstream) and the NanoLuc luciferase (upstream). The resulting emission rates that were detected at 460nm are indicated in Fig. 2. The conditions of each reaction are specified below their respective bars. All measurements are already subtracted for the background emission. The addition of 15 mM of the compound (5) resulted in a higher emission rate compared to the sample containing the 5 mM concentration. It is worth mentioning, that compound (5) was specifically designed for the riboswitch compared to the original precursor compound (1). Therefore, these results indicate a higher binding affinity of compound (5) to the riboswitch. Overall, the results were very reproducible along biological triplicates, as suggested by the small error bars. Figure 2: Light emission detection of the NanoLuc reaction for different riboswitch activators and concentrations. 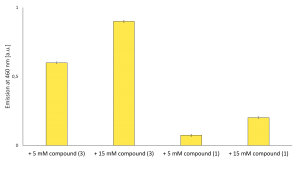 Addition of compound (5) to the reaction resulted in increased enzyme activity as indicated by the two bars on the left-hand side compared to the compound (1) reaction. The increase in enzyme activity upon addition of the specific riboswitch activator was determined in relation to the enzyme activity in presence of the initial substrate. Fig. 3 shows that the enzyme activity increases 1.5-fold when using the newly synthesized substrate. 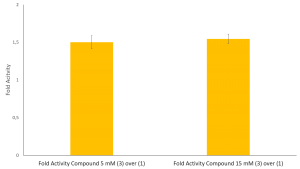 Figure 3: Fold enzyme activity upon addition of compound (5) compared to compound (1) at either 5 mM concentration (left bar) or 15 mM concentration (right bar). At both concentrations, compound (5) exceeded the reaction activity of compound (1) by 1.5 fold.